How to Perform Perfect Golf Swing? The best ball strikers in the world have copied other great ball strikers’ swings. They look at what others do successfully, and copy it. But if you look at their swings from a distance, you can tell whose swing it is. It’s easy to spot the difference between a Rory McIlroy and a Tiger Woods. It’s easy to spot the difference between Greg Norman and Nick Faldo. It’s easy to spot the difference between Sam Snead and Ben Hogan. Every great pro has a unique swing to them. 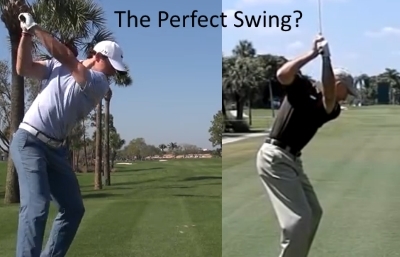 Even though they’ve copied others, you can tell it’s their swing and it’s unmistakable. The same is true with amateur golfers’ swings. You can tell your regular playing partners’ swings from a distance off. So what’s the difference between a pro and an amateur golfer’s swing? This is what I believe it is. A pro has a very clear idea in their head as to how they want to swing. Whereas the regular amateur has no clear idea. Not only that, the average amateur goes around in circles with their swing. They try one thing after another trying to find the “secret”. A pro never does that. They have their swing and they make small changes to it. Pros know exactly what they’re trying to do at each stage of their swing. And even if they don’t do what they want (when you look on video in slow motion), they have a feeling and clear image in their mind as to what they’re trying to do. But amateurs do not have this. Well, this is what I suggest. When you have watched professional golfers’ swings in the past, you would have a couple of favorite players’ swings. There will be things about their swings that you like. They might not even be the best golfers in the world. 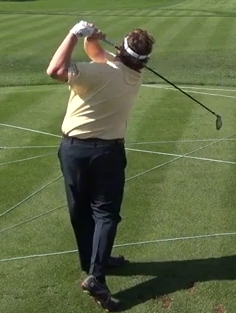 For example, you may like Angel Cabrera’s golf swing. You may like Zach Johnson’s golf swing. You may like Dustin Johnson’s golf swing. You may even like Jim Furyk’s golf swing. Everyone will have different likes and dislikes when it comes to looking at golf swings. But I suggest you come up with 3 golfer’s swings you like the look of. Once you’ve done this, then I suggest you try and narrow it down to one golfer’s swing that you like and think would be a good match for you. When I say a good match for you, this is what I mean. Are you tall and wiry? If so, I wouldn’t recommend you try and swing like Tim Herron. If you are, then I wouldn’t recommend you try and swing like Dustin Johnson. Are you tall and well built? If you are then I wouldn’t recommend you try and swing like Rory McIlroy. So the very first thing you must do if you want to build the perfect golf swing for you, is to find someone with a swing you like that has similar physique to you. Once you’ve done that, then you you need to study their swing at each stage, so you have a very clear idea on what they do. This is going to be your blueprint for your perfect swing. Please, however, understand this. Great golfers have copied other golfers’ swings, BUT they never look exactly the same. Everyone is different. So even with you copying one great golfer’s swing, doesn’t mean you will or should look exactly like them when you swing. What’s more important, is that you have a very clear idea in your mind as to how you are going to swing. After you have a very clear idea in your mind about how you want to swing, then you should not waiver. Don’t go trying one swing method after another. Don’t go trying one swing tip after another. Don’t go looking for some swing secret. Instead, you need to program your mind and body to groove the perfect golf swing for you. But be warned, if you go about this process in the traditional way, it’s going to involve you hitting thousands of balls to groove the new swing into a habit. I’ve discovered a massive shortcut to doing this. And I have put together a new program to teach you how to find the perfect golf swing for you, and then groove that golf swing over and over again in the minimum amount of time. There is nothing out there like this new method of improving your golf swing. It’s a revolutionary breakthrough in golf instruction. So if you want to FINALLY hit the ball longer, straighter and more consistently, without the need to hit thousands of balls, go here to find out more.